Here's an event that takes muscle and guts: stretch-winding rubber motor for Wakefield class at National meet. "Viscount" full-house radio plane by Harold deBolt features steerable nose wheel, is "free-lance" design. 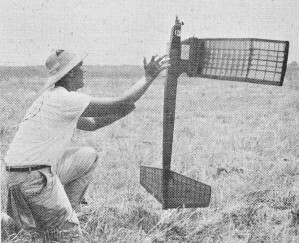 Vertical take-off (VTO) launch demon­strated by Class A free flight craft; it has .15-size motor. Model requirements are not too extensive; most important, bonus points are awarded if it is a scale model of a U. S. Navy carrier aircraft. Maximum wing span allowed is 44 in. ; any size engine can be used but must correspond to thrust type used on prototype aircraft if model is a scale job. Model may have fixed or working retractable landing gear. An arresting hook must be fitted but cannot be longer than 1/3 the fuselage length. Most popular model types are scale versions of the prop-driven WW-2 and postwar aircraft, There are numerous scale kits for these types, spans range from about 30" up to maximum allowed 44." Engines with throttles, .35 to .60 cu. in size are favored. Throttle, wing flap, arresting hook and rudder controls are used in various combinations and operating systems are usually developed by the individual modeler. Scoring in competition is divided into four phases. Model must take off successfully from free-roll area of deck. Model is then timed for 7 high speed laps. After slowing it is timed for 7 slow speed laps. When these laps are finished model must then make an arrested landing on the carrier deck. Scoring is scaled for normal 3-point attitude landing, arrested landing in other than 3-point attitude and if model ends up on its back or with one wheel off deck. C/L PRECISION ACROBATICS - Ever since Jim Walker turned that first loop with his Fireball, precision acrobatics (or "stunt" as it is usually called) has been the most popular part of control line flying. Stunting a yoyo model is a really challenging sport and gives a flyer .an opportunity to develop and polish his flying skill and timing. The happy fact about stunt flying is that the flyer has the best view of his model's antics. 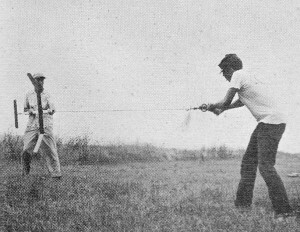 Stunt maneuvers are patterned directly after those done in real aircraft, with the exception that lateral rolls cannot be done because of the limitation of the flying wires. (Walker once rigged a frame around his Fireball permitting honest-to-gosh slow rolls). As a matter of fact, many model stunt maneuvers would be impossible to perform in a real airplane. The model stunt maneuvers that are done make an impressive list: Wing overs, inside loops, inverted flight, outside loops, inside and outside square loops, horizontal eights, vertical eights, hourglass figure, overhead eights and a real toughy, the four-leaf clover, Dizzy yet? It sounds terrifying and it is at first, but you don't just go out and fly the whole routine right off. This is the fun of stunt flying, you can start with the simpler maneuvers, master them, and then try tougher ones as your technique improves. All the maneuvers are based on the loop, the more difficult are a series of loops linked together in various combinations. Here's where the precision part comes in. It is not just sufficient to flip your model over on its back, then snap it' back level again ... your loop will be pretty lopsided or egg-shaped. The idea is to make the model flight path a neat round circle, finishing at the same altitude as started and not exceeding a specified angle above the ground. Precision acrobatic competition rules have definite limits of airspace to be utilized for each maneuver (see A.M.A. regs), The maneuvers must be done in a given sequence and scoring is based on ability to perform maneuvers smoothly, at proper heights and of correct shape. Takeoff and landing are also graded for scoring. One other feature of competition scoring is the judging of the model's appearance. Points awarded for workmanship, realism, finish and originality are added to the flying score. Competition flying is generally divided into flyer age groups rather than model or engine divisions. Junior, up to 16 years; Senior, 16 to 21, and Open, 21 and over. There are stunt models for every engine class but the larger .29's and .35's are favored for competition, because they have the power to pull the model smoothly through the wind. large .60 powered ships fly very well but the engines consume a lot of fuel. The smaller .049 to .15 powered ships make excellent trainers but are tricky if wind is strong. Stunt models range in size from about 2 ft. span for 1/2A's to 4-1/2 ft. span for .35's. Wing areas are generous, employ thick symmetrical airfoils; built-up fabric covered surfaces are used for lightness. Fuselages are usually sheet balsa planked and mounts and side doublers are hardwood and plywood. Flying is done with 25 ft. to 70 ft. long flying lines depending upon engine size. These relatively light weight, over-powered designs have a high degree of maneuverability, some can practically turn in their own length. Although speed IS not the object of stunt-flying, some models move at 85 mph. Designs are commonly short-coupled tractor configuration with a few flying wings and pod and boom layouts. FLYING SCALE - Everybody loves a good scale model. Other phases of flying may attract more contestants, but all modelers are fans of flying scale at heart. There have been more kits and mag plans produced of scale models than any other type. The appeal of a miniature copy of a real airplane cannot be denied. 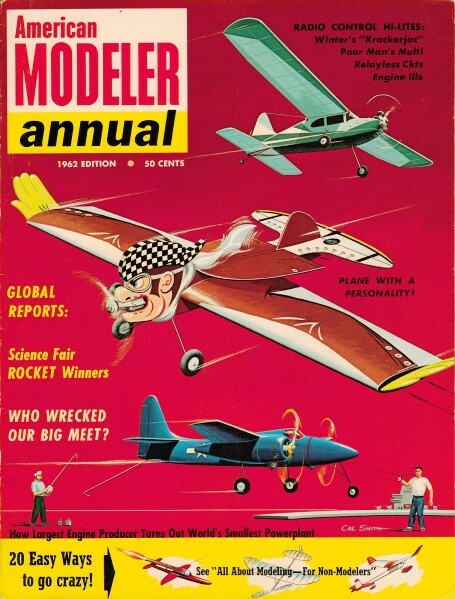 After all, this is what the model hobby is really all about-models of airplanes. Although other specialized model types have evolved, the scale model is the all-time favorite. Scale models are flown. in every type category, There are rubber-powered flying scales, engine powered free flight, control I ine and radio control flying scale models. All have their special features depending upon the type of flying and power plant used. The full range of aviation history appears in the great variety of flying scale models available to the modeler. The simplest flying scale, models are the small rubber-powered type. These have built-up construction with tissue covering. Spans average 18" to 24". Flight performance is limited, but they are great fun for sandlot flying. There is no contest category for these sport flyers. Many of the rubber-powered designs can be powered with the Pee-Wee engines and flown free flight. There is contest flying for gas-engine powered free flight scale models. Interest is limited, since good flying' performance and scale fidelity are both required. These factors are not always easy to achieve because not all real aircraft proportions and designs have good flight stability when scaled down. Most favored types are the high-wing cabin monoplanes because they have the necessary inherent stability. Most biplanes also perform well here. Contest regulations are few: engine size is limited to .20 or under cu. in., model must R.O.G. and fly for at least 40 seconds. Model is judged for scale fidelity, finish and appearance. Each part, wing, tails, interior, etc. is scrutinized and scored. Construction follows usual light-weight free flight practice but more careful finishing and detail work is the rule. Models range in size from 30" to 54" span and engines used are .049 to .19 size. Most popular type of flying scale model is the control liner. Because of the built-in stability afforded by the control system and flying lines, practically every type of real aircraft has been copied and flown in control line scale. There are World War I and " fighters and bombers, racers, sport planes, transports, twin engine, four engine and even six engined B-36's. Dyna-Jet powered fighters have also been built and flown quite successfully. solid construction. Fuselages and wings are usually planked with sheet balsa (depending upon prototype structure) so that top quality finishes can be achieved. Scale building requires a high degree of craftsmanship, ingenuity and patience, to produce a contest winning model. Many modelers spend as long as a year producing a single model for the big Nats competition. Contest regulations permit engines up to 1.25 cu. in. 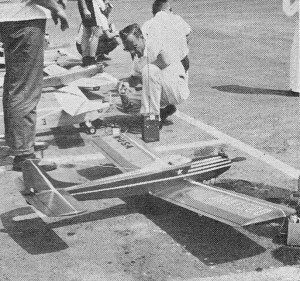 size (and Dyna-Jet). Models are flown on 52-1/2 to 70 ft. lines except 1/2A's which can be flown on 35 ft. lines. Model must R.O.G. and fly at least 10 laps to qualify for scale judging. No points are given for actual flight but additional points are awarded for scale operation during flight of landing gear, flaps, throttle control, taxiing. Judging of workmanship and scale fidelity is scored on model's appearance, color and markings. Each part, fuselage, wings, tails, gear, cowl, is carefully examined. Contestants must provide authenticated 3-view drawing of the prototype for judges comparison with the model.